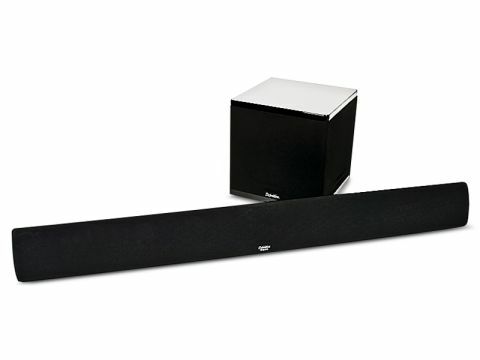 For anyone who doesn't have the space for five speakers in the front room, a single wall-mountable soundbar seems like the ideal solution. But can one narrow box full of drive units really replace a proper surround setup? The answer all too often is 'no', but Definitive Technology (DefTech to its fans) reckons its Mythos speaker goes further than any other by 'bending' sound waves around the audience to create the illusion of cinema sound from a single source. The Mythos provides all five channels as individual drive units, with specially-shaped surround drivers to guide the rear effects to the back of the room, and a high performance subwoofer providing the LFE signal. Sling it under your TV – it comes with a bracket and installation instructions – and connect it to your amp with five runs of speaker cable and you're almost there. Adjusting the subwoofer to match the speaker levels is a matter of taste, but it's still relatively easy to get a well-balanced sound flooding your room. For such a thin cabinet, the small drive units do a distinguished job of projecting into the room and providing a bouncy, full-bodied bass. I suspect that's partly due to the unusual concentric tweeter design that seems to stick out in front of the mid bass drivers, and partly because of the superb SuperCube III woofer. The mid-bass drivers and their supported tweeters deliver the front left and right and centre channels. They do this with a close attention to detail that gives the Mythos set a delicate sound, well-suited to music and subtle soundtracks. This integrates well with the compact sub. Despite its comically small dimensions, it packs a potent 650W Class D amp that can kick out an alarming amount of grunt. Unsurprisingly, the modest 7.5in driver can't reach the lowest frequencies, and it works best with the crossover set no lower than 80Hz, but at this level, you have all the punchy bass you might reasonably expect. Two side-facing passive radiators, the same size as the main woofer, help shift some air. The Mythos system can't actually fill a huge room with sound. I heard distortion in the treble before reaching really high volume levels, but at the same time, it doesn't rely on side walls for reflection, so it's much more flexible about the space that it'll work in, and its output level is a massive step up from any TV. The tricky bit with forward-facing soundbars is, of course, making it sound as if the rear FX are coming from behind you. Definitive Technology attempts to achieve this by using a central plastic waveguide that directs the sound waves to the sides and with a slight delay. It's not wholly convincing; this arrangement can't direct sounds with pinpoint accuracy, like the bullets in Blood Diamond that zip from the front to the back of the room. However, it does give a pleasing three dimensional feel and, at times, the illusion of wrap-around sound. The SSA-42 will fit fl ush with a 42in TV, while its larger brother, the SSA-50, is designed to compliment a 50in set. Being a sealed enclosure, with no front or rear ports, it's unfussy about placement. Hiding the bundle of five speaker cables might still be a challenge for any installer, but this is indeed a product of convenience that'll bring surround sound thrills to rooms where there's simply no space for speakers.